We've worked hard these last fifteen months, trying to create a new image for our house. For the last six or seven years, it's been known as the house no one can seem to keep, since it's been in foreclosure three times before. It's also spent the last fifteen years as the house with the ugly yard. Excuse me....the "natural landscape" as one nice little old lady neighbor put it one day. Earlier in the Spring we did a good amount of work cutting down trees and leveling out the yard, trying to make it look like that someone at least cares about the look of the yard and is trying to do something with years of neglect. I guess we did pretty good since several neighbors stopped by to say how much they appreciated we were finally doing something with it. Yesterday however, we got a unexpected new look to our house. This whole little weathervane/tower thing bit the dust. In fact, it was pretty surprising. Olivia and I walked out to get the mail and on our way back towards the house, I noticed a noise coming from the tower. We stopped and I told Olivia that something must have gotten in it. All the sudden, the thing came crashing to the ground. Thankfully, David was a little late coming home, because it fell right where he parks his car everyday. He pulled up only five minutes after. Thankfully, there was no damage to any cars or anybody. It was obvious it was rotted, but the fact that it was a clear sunny day without a wind gust in sight, made it a little shocking. David climbed up and took the rest of it down. 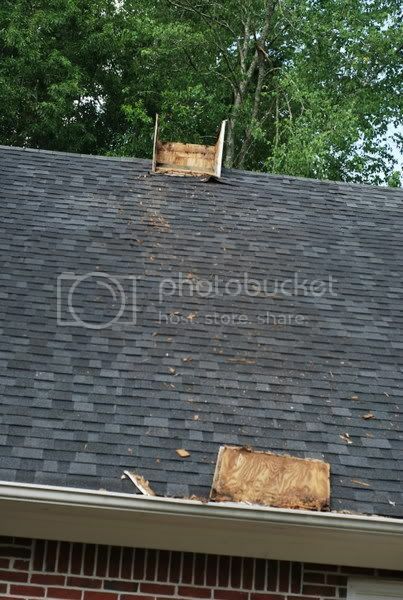 Thankfully, the roof did not look damaged or in need of any repairs. 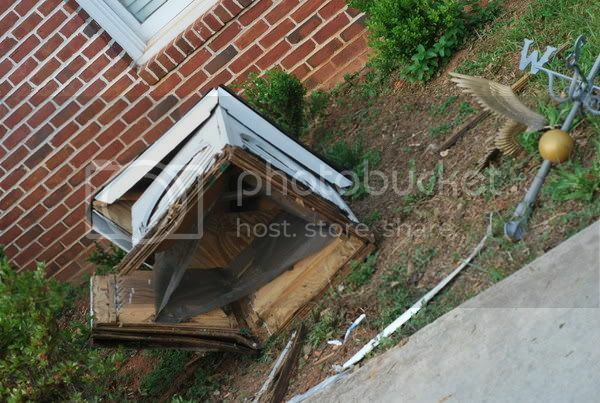 I don't think we'll rebuild one to put back up. I liked it since it gave our house a little character, but not enough to shell out the money for a new one anytime soon. 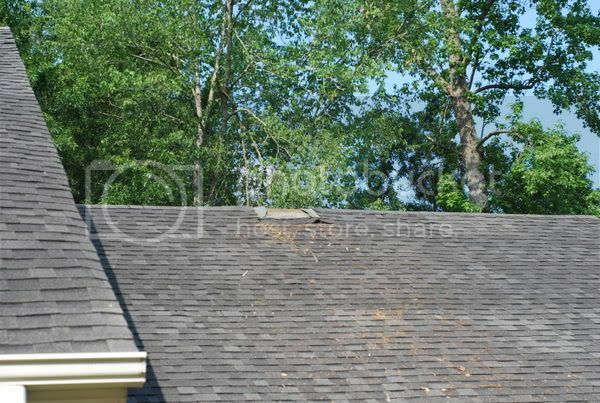 For now, he's just going to cover the open area with new shingles. 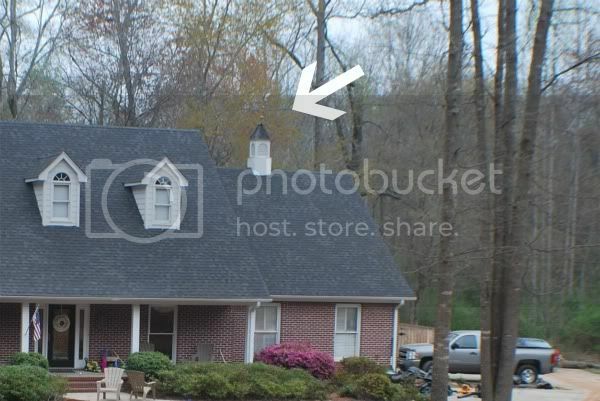 So, if you come over, that's what happened to the weathervane. It's one part of our house that people usually comment on, so I'm kinda bummed now I can no longer say, we're the house with the weathervane. We were the only house in the neighborhood that had one. Now we're just starting to look like everyone else. Oh, please don't judge my flower beds, I ran out of motivation for the yard a while back. They'll have to wait till fall or next spring.